Obituary – McMurtrie, Lorna Renee (Dayton) « Perry High School Alumni Association, Inc.
Lorna Renee Dayton McMurtrie, resident of Tonkawa, passed on June 22, 2005 at her home, she was 38. Funeral services will be held Saturday, June 25, 2005 at 10:00 AM at the First Christian Church in Tonkawa with Reverend Mike Marsters officiating, interment will be in the IOOF Cemetery. Pallbearers are Lynn Hunt, Larry Ailey, Kenny Buesing, Tracy Sherman, Rick Moritz and James Morris. Honorary pallbearers will be James Smart, Gary Beates, John Burns, Brad Bechtal, Ed Molzahn and Larry Kienholz. Services are under the direction of Anderson Funeral Home. Renee was born July 20, 1966 in Perry, Oklahoma. She was the daughter of Lorn and Kay Dotts Dayton. 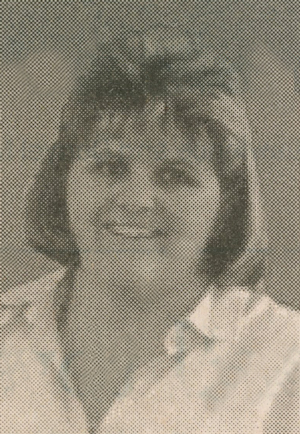 She attended Perry Public Schools, graduating in 1985. Renee and Justin S. McMurtrie were married January 25, 1992 in Perry, Oklahoma in the Grace Baptist Church. They moved to Tonkawa shortly thereafter. Renee worked at Buesing Pump before going to work for the Charles Machine Works (Ditch Witch) in August 1999. She enjoyed her work and the many friends she had in the CMW family. Renee was baptized in the Grace Baptist Church in Perry and attended the First Christian Church of Tonkawa. Renee was a loving wife and dedicated mother. She enjoyed being with her children and supported them in all their activities. Renee was involved greatly in the FFA and 4H. She loved being around and raising cattle. The best times of her life were enjoying the outdoors, fishing, hunting and camping with her family. She is survived by her husband, Justin McMurtrie, one son Justin R. McMurtrie and fiancé, Carrie Robinson of Stillwater, one daughter, Darion McMurtrie of the home in Tonkawa. She is also survived by her father Lorn A. Dayton, Longmont, Colorado and her mother Kay Lee McAnally of Perry, her paternal grandmother Floris Dayton of Perry; her mother and father-in-law, John and Cormaleta McMurtrie. Renee was preceded in death by her paternal grandfather, Claude Dayton and her maternal grandparents R.C. (Bus) and Dorrit (Dutch) Dotts. Memorial contributions may be made in her memory to the Faith Hospice Services, LLC, 114 S. Main Street, Blackwell, OK 74631.